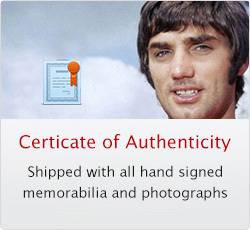 Rare and exclusive George Best, Manchester United and European Cup signed photos and autographed memorabilia. George Best & David Sadler signed black and white official Manchester United 1964-65 league champions team photograph. Mounted in white over black together with a black and white photograph of Manchester United celebrating. Includes 'Certificate of Authenticity' with your order.